Serafina Buttercup Redwing! She is 14 weeks old and looks like a Japanese Cartoon baby but she is really a 3.4 pound Shih Tzu with her sister Kaylee Rae Redwing in the background. I stumbled on a couple of folks in Mound, Minnesota practicing a beautiful new sport. It was one of those standard sunny and cold (14 degrees Fahrenheit) and windy days in January in Minnesota. I was on my way to visit my in-law's to negotiate some post-xmas gift card exchanges and I stumbled on this sight on North Arm Bay of Lake Minnetonka! This is the latest thing - Kite Skiing. 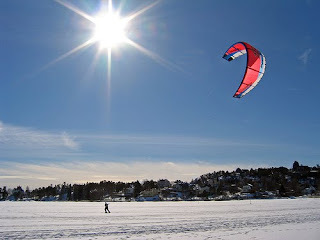 You hook up a large kite to your body and use regular downhill skis to be dragged around the surface of a frozen lake. 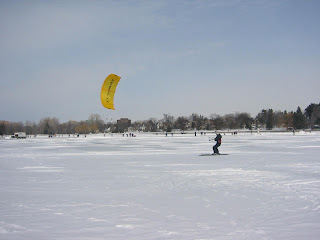 It looks fun - you are actually harnessed to the kite - and some of the skiers caught alot of air. All of them wore helmets lest they test the thickness of their skulls against frozen ice (wise!) I drove onto the ice at the boat launch and talked to one of the guys - they said it was way easier to learn than windsurfing. If you can master the basics of cross-country skiing and flying a kite or basic sailing this sport is for you. 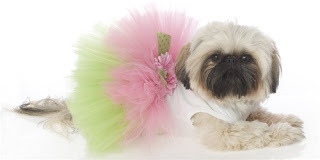 Tutu for Shih Tzu - it will be great for spring in a couple of months! Kaylee got a new dress - a tutu! I have a great run going at the moment: I have a challenging job with good prospects. The family is healthy and doing well. And I’m updating my resume frequently, because recruiters keep calling about very, very big opportunities locally. I am not budging from my "cake spot" now but it's nice to build my network of over 500+ contacts on LinkedIn. I’m finally feeling comfortable in my skin, and in a place I’ve worked so hard to reach. I got a great email from a former Manager who said "of all the people I've managed, I knew you would be a VP." I don't know if that is a compliment...LOL. It must be my Lutheran background (says Prairie Home Companion), but I can’t shake these feelings of mediocrity and inadequacy. My career is great, my husband and pets are joys, and the tree is coming down on time from the holiday season—but there is no way my house looks, smells, or feels as perfect as the Williams-Sonoma or Pottery Barn catalogs say it should. Call it sexist if you like—I call it an upbringing by a mother who could out-“good thing” Martha. We were raised to fold hospital corners on beds, extra vacuuming sweeps mid-week, removing crumbs of kitchen surfaces before wiping, cooking from scratch, put the seat down, get DOWN on the floor to clean it, and never, ever let crumbs accumulate in the flatware drawer. In other words, I know how to make my home look that good. And I want it to look that good. But it’s the last thing I want to do after a 60–hour work week. But I want it all. I want my house perfect, and I want to keep working my career at this pace. I’m having a hard time settling for anything less. Oh - what about the obvious? Guy is against hiring a housekeeper. Though he's okay with a daily dog walker and lawn service...so who is he kidding? Women are outpacing men in college degrees, workforce percentages, and consumer spending. 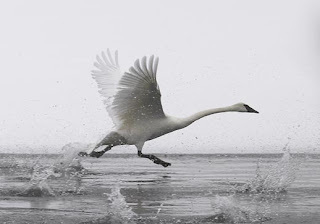 We have greater opportunities than ever to pursue our dreams. But when a girl’s dream includes coming home to a sparkling home every night, something’s gotta give. Ugh. Time to teach my puppy Kaylee how to fold clothes out of the dryer.